With three ‘very poor’ and five ‘poor’ air quality level days in the past eight days (October 19-25), Delhi has rightfully made headlines for its deteriorating winter air quality. 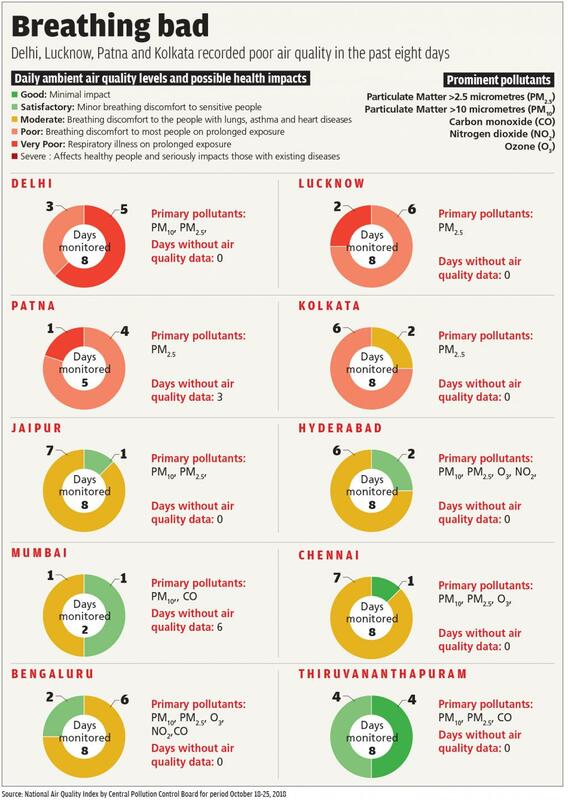 But an analysis of the same period shows equally worrying air quality levels in three state capitals—Lucknow, Kolkata and Patna. The Central Pollution Control Board’s air quality index shows that in the past eight days, Lucknow had two very poor and six poor days. Even Kolkata had poor air quality on six of the eight days. As per the Air Quality Index (AQI), prolonged exposure to very poor air can result in “respiratory illness” and ‘poor’ air can cause “breathing discomfort to most people”. Patna, despite having alarming air quality levels, did not calculate the levels on three of the eight days. Monitoring has been an issue in Patna in the past as well. The capital city did not calculate air quality levels for 11 days in December 2017, says State of India’s Environment in Figures 2018, Down To Earth's annual analytical publication. The primary pollutant in these capital cities was PM 2.5 (particulate matter with a diameter of less than 2.5 micrometers), which is caused by vehicles and industries, power plants, garbage dumping. All the capitals with poor air quality are in the Indo-Gangetic plain, which has inherent disadvantages due to its geographical location and soil composition. With Diwali just days away, the governments of these states should act fast.